These shoulder exercises for kids can help to improve their upper body strength. Good shoulder girdle stability can make it easier to control the smaller movements of the hands and fingers. 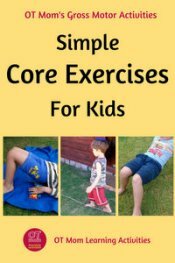 For this reason, kids should be doing lots of gross motor activities to help strengthen their shoulder girdle as well as their other core muscles. 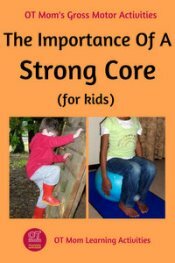 The activities on this page will give you some easy and fun ways to help your child work on their uppoer body strength and stability. However, if you are at all concerned about your child's development, please get a professional opinion. The activities on this page are NOT a substitute for an occupational therapy evaluation and treatment. Hand Pushes - a good classroom exercise! Caution: Your child should only take part in these activities if he/she is medically and physically able to do so. Please get a professional opinion if you are at all uncertain. You should only demonstrate these activities if you are medically and physically able to do so. You do so at your own risk. If you are physically fit, then demonstrate this by lying on your tummy and pulling yourself along with your forearms. Encourage your child to not splay the arms too wide, or to use the legs too much - the leopard crawl should work the upper body the most. 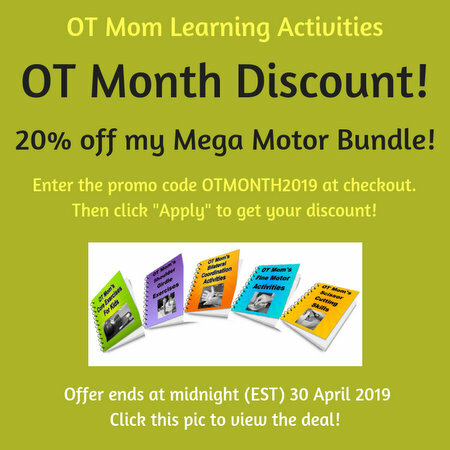 This is a great obstacle course or follow-my-leader activity (especially if an adult is involved!). Doing it under tables and chairs is a great incentive, and as an outdoor activity, it lends itself well to a jungle or army theme party! The photo on the right shows the child splaying his arms and thus not working the shoulder girdle muscles as effectively. Crabs actually walk sideways, but this is really tricky for kids, so start by asking your child to walk backwards for a short distance, keeping the back and tummy straight and bottom off the ground! Doing the crab walk actually works the core muscles as well as the shoulder girdle muscles, and many kids struggle to hold the position at first. As for as shoulder exercises for kids go, the crab walk is quite demanding, so set a short distance (2-3metres) for your child’s first attempt, and include it as a small part of an obstacle course or follow-my-leader game. As your child’s endurance increases, you can increase the distance set. Pushing exercises encourage your child to activate the shoulder girdle muscles through pushing hard. Encourage your child to keep the elbows slightly bent, so the arms are not straight. This helps the shoulder girdle muscles to work most effectively. Take note of the difference between effective and ineffective positioning, then have fun trying out the activities that follow! Try a Wall Push or a People Push - my kids always love trying to push an adult (sometimes we let them win!). Tell your child the wall is falling down, and ask your child to push it to keep it up! You can have your child push for a count of 5 or 10 seconds, run around the garden and then come back for another push. Make sure your child has only the hands on the wall (no forearms, trunk or shoulders), and try and keep elbows slightly bent. For the People Push, have both pushers put their hands together as shown in the photo above, with both pushers keeping elbows slightly bent. Have your child crouch facing the wall, putting the hands on the ball. Have your child "walk" the ball up from the floor with his/her hands until the ball is at shoulder level. Then "walk" the ball along the length of wall, keeping it at the same height. Repeat a few times. 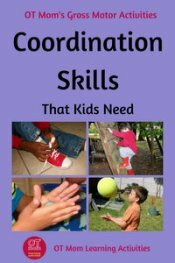 Your child's hands should cross over as the ball moves along. Aim for slow controlled movements – the child who wants to do it quickly can sometimes be compensating for the lack of stability needed to do it slowly in a controlled way! 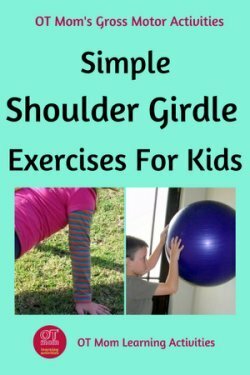 These are great shoulder girdle exercises for kids to do before starting any writing sessions. They are also good to help fidgety kids focus as they give great proprioceptive input! Place palms together, with elbows out and forearms held horizontally as in the photo. Now have your child push the hands together as hard as possible and hold for 5 seconds. Have your child place hands on either side of the chair and PUSH, until his/her bottom rises off the chair. Hold for 3 - 5 counts. Ask your child to try and lift his/her feet off the floor and hold them off while doing the push-ups. 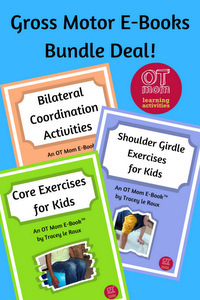 All of these exercises and more can be found in my Shoulder Exercises for Kids E-book. There are 14 pages of photographed activities to help your child build upper body strength and shoulder girdle stability. These include pushing and pulling games, weight bearing activities, and ideas to use with a therapy ball or at the park. All for just $5, the price of a coffee or two! 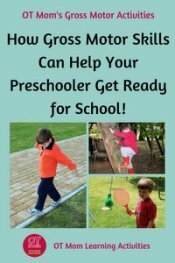 If you are looking to work on your child's gross motor skills, check out these related pages on my site. Thanks for visiting my site! I hope you found this page helpful!